By Noelle Jones. First published 2017. Australian rules football and trams are integral to life in Melbourne and over the years many talented players also worked for the tramways. William (Bill) Nolan was a cable tram gripman (driver) and a highly regarded follower , playing two seasons for Richmond before he enlisted in the Australian Imperial Force (AIF) in July 1915. Bill was born on 4 September 1888 in the small Victorian town of Corop in the Goulburn Valley, between Rochester and Rushworth. At that time his Irish-born father, John Patrick Nolan, was a publican in Corop. John Nolan was also active in community affairs, having been at various times president of the Waranga Shire Council and chairman of the Waranga and Echuca Water Trust. It was a large family. John Nolan had remarried after his first wife died  there were four children from his first marriage and another 12 children from his second marriage to Elizabeth Mary Cullen. Bill was the youngest son from the second marriage. Over the next few years the family went through several moves to other Victorian country towns. By 1890 they were in Tolmie (north-east of Mansfield) where John Nolan was a storekeeper, postmaster and president of the local railway league (which sought to connect the Tolmie district to the existing railway system). Bill attended Tolmie State School. In 1902 the family relocated to Mansfield, and several years later to Kanumbra, north-east of Yarck. By his early 20s Bill was a star back in the Yarck football team, which played in the Alexandra and District Association. His older brother Vincent was also a member of the team, and was captain in 1911 and 1913‑14. Around 1912 Bill Nolan moved to Melbourne, and in January 1913 joined the Melbourne Tramway & Omnibus Company (MTOC) as a gripman working out of South Melbourne depot. He worked with MTOC for two and a half years, until he enlisted in July 1915. Prior to joining MTOC, he was employed as a labourer. Gripmen tended to be big men with powerful shoulders, due to the constant physical effort of pulling and releasing the grip and brake levers, which were operated without any form of power assistance. Contemporary accounts describe Nolan as a six-footer, although his military service record states that he was five feet ten inches tall (178cm). 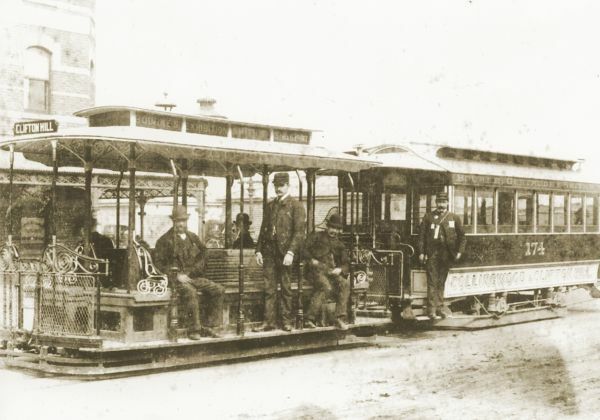 Collingwood and Clifton Hill cable tram, pre World War I. The uniformed gripman (driver) is standing in the grip car, and the conductor is standing on the step of the rear trailer car. Photograph from the Melbourne Tram Museum collection. His MTOC employment record details a collection of incidents fairly typical for gripmen. Although traffic in those days was very light, accidents were common. Pedestrians had no qualms about ducking in between and in front of moving cable trams  in the c1910 silent film Marvellous Melbourne: Queen City of the South pedestrians and cyclists (even a dog) wander across streets in the centre of Melbourne, seemingly oblivious to the cable trams hurtling past. There were three occasions in which Nolans cable tram knocked down pedestrians, plus there was a collision with a cyclist, two collisions with carts and a collision with a waggonette  in each case he was found not to blame. On two other occasions  involving collisions with a timber jinker and a motor bus  Nolan was cautioned. The motor bus collision resulted in damage costing 66 shillings  apparently a sum worthy of noting within his employment record. At that time a new grip car (excluding the grip mechanism) cost 180 pounds, so the damage was equivalent to just under 2% of this amount. Nolan continued his football career in Melbourne, initially playing with Brighton in the Metropolitan Junior Football Association  and then in 1914 advancing to the Victorian Football League (VFL) with Richmond, where he wore the number 7 jumper. His first VFL match was in the opening round of the 1914 season against St Kilda at the Junction Oval. Nolan also played in the Victorian Tramway Football Association (VTFA). Formed in 1913 this was a competition between the various depots and supported by the tramway union, the Australian Tramway Employees Association (ATEA). Many players from other associations, such as the VFL, also played in the VTFA competition  the latter was held on Wednesdays so did not interfere with the Saturday matches of the other competitions. In 1913 and 1914 Nolan was a member of the South Melbourne tramway team, which was fielded from staff of the South Melbourne and Port Melbourne depots. The team uniform was a white jersey with a red band and blue stockings  similar to the contemporary South Melbourne VFL side, except for the socks which had red and white hoops. Home matches were played at the South Melbourne football ground. Another Tramway ANZAC  Hugh Spence  also played in the South Melbourne side. Only six tramway teams played in the 1915 season, down from the eight teams of the previous two years. South Melbourne did not field a team, and so Nolan transferred to the Richmond tramway team. In the 1915 tramway semi-finals played in June, Richmond lost to North Carlton. Nolans VFL career comprised 30 games for Richmond across the 1914 and 1915 seasons, as a follower or back, missing only one match before he enlisted in July 1915. Nolans final VFL match was against Fitzroy at the Brunswick Street Oval on 31 July 1915  eleven days after he enlisted. Nolan had previously served for two years in the Militia, with the Light Horse troop at Yea. He enlisted as a private and his address at enlistment was given as Marden Tahara Road, Toorak. He was not married, and an allotment from his military pay was sent to a Miss C.M. Nolan at the same address  most likely his sister Catherine. He was selected in the soldiers Camp Team to play Carlton (the 1915 VFL premiers) in an exhibition match the week after the 1915 VFL Grand Final, but was unable to obtain leave from camp. The soldiers team was fielded from enlisted VFL players; Carlton won by 20 points (13 goals 11 to 10 goals 9). On 14 October 1915 South Melbourne depot held a concert to honour six staff  including Nolan  who had enlisted. Due to military commitments, Nolan and three others were unable to attend. A representative of MTOC presented a wristwatch for each of the men, which was accepted on behalf of the absentees. Nolan was initially assigned to 7th Reinforcements of 23 Infantry Battalion. On 25 November 1915 he embarked from Melbourne on HMAT Commonwealth A73. On arriving in Egypt in February 1916 he was re-assigned to 58th Battalion  he had previously been an Acting Sergeant but reverted to the ranks when joining this battalion. Within two weeks, Nolan was promoted to Sergeant. Around half of the newly raised 58th Battalion were Gallipoli veterans from 6th Battalion, with the remainder being reinforcements  like Nolan  mostly from Victoria. The battalion was part of the 15th Brigade of the 5th Australian Division. On 23 June 1916, 58th Battalion arrived in France. Its first battle was the disastrous Fromelles offensive. More Australian lives were lost on that one day  19 July 1916  than on any other in our history. 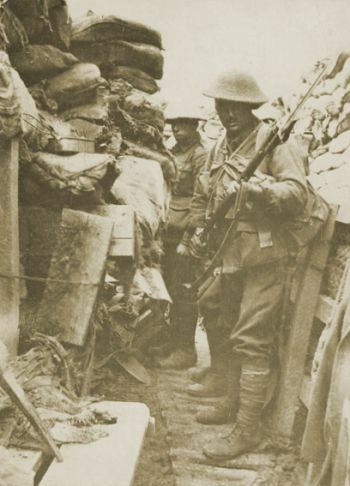 In a trench a few minutes before the attack at Fromelles: men of the Australian 53rd Battalion. Photograph courtesy Australian War Memorial (H16396). On 1 July, the British, under the command of General Sir Douglas Haig, had mounted a major offensive in the Somme region, about 100km away. A diversionary attack was planned for the evening of 19 July at Fleurbaix (Fromelles being behind the German lines), with the objective of preventing the Germans from sending reinforcements to their defences in the Somme. A preparatory seven-hour bombardment had little effect on the German defenders, and when the Australian 5th Division and British 61st Division attacked at 6pm they suffered horrendous casualties. The men of 58th Battalion were mown down by machine gun fire, with casualties comprising almost one-third of the battalions strength. At the end of the battle, no ground had been gained. In that single night, there were 5,533 Australian casualties at Fromelles, including around 2,000 deaths of whom 1,299 were never found . The recovery of the wounded continued for another three days. As a diversionary tactic, Fromelles was an utter failure. The Battle of the Somme, of which Fromelles was just a small part, was to last around five months. 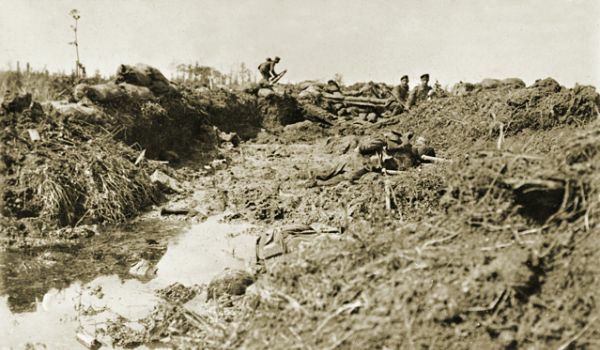 Portion of the German second line held by the Australian 31st Battalion during the Battle of Fromelles. This photograph  with three German soldiers in the rear  was taken during the morning of 20 July 1916 whilst the Germans were re-occupying their original position. Photograph courtesy Australian War Memorial (A01562). According to eyewitness accounts Nolan was in the first wave of the attack on enemy trenches on 19 July 1916, but he did not get far before being wounded in the shoulder and thigh. He was described as the coolest man under fire and remained cheerful after being wounded. Nolan was admitted to the 15th Field Ambulance then transferred to the 8th Casualty Clearing Station, before being admitted to the 13th General Hospital on 21 July. Two days later, Nolan died of his wounds, which were described in his medical records as severe. It was said that he remained cheerful until the end. Big, brave Bill Nolan is reported to have been killed in action. It does not need any superfluous words here to paint his splendid qualities. He was 25 years of age [sic], but as I knew him first, only a few years ago, he was just a big, shy innocent boy. It was after his last season with a junior team and he had signed on to play with Richmond. He would stand around at times and listen to the talk, but it was seldom that Bill ever put an extra word in. But he was by no means unsociable. Once launched into conversation, he could tell, in his own quiet way, some droll stories, and no man that ever had him for a friend ever wished for a better one. His career as a League footballer was spread over only two years, but right from the beginning he was phenomenally successful. In his very first game he showed persistency and pluck that are essentials in a follower, and it was seen that he was going to be a tremendous help to the Richmond side. As the games went on he continued to demonstrate his abilities and before the season had gone very far was one of the fixtures on the Richmond board. He played in every game [sic]. In the following year he was better than ever, and he was considered one of the best followers in the League. There is little doubt that with no war and with football going on as usual, Nolan, with the experience that he gained would have been the champion of them all this season. But when the war broke out Bill Nolan heard the call. He played in most of the football games last year, getting special leave from camp to do so towards the end, and soon after that came, he sailed for the front. Nolan soon won his way in the ranks and was made a sergeant. But in Egypt his abilities and popularity with the men won him further recognition, and he was in command of a section. Before me, as I write, are letters from Richmond boys who served with Nolan in Egypt. In them are such tributes that few men have ever had. He is a real white man, writes Arthur Hatherly, one of the many Richmond boys who admired the make-up of Nolan. And he continues, the boys here would do anything for him. Every member of the Richmond football team had a respect for Nolan. So did every supporter of the team. So did the supporters of the other side. The smaller players admired the splendid physical strength of the hefty young giant, and turned to him naturally as their protector. They knew that Bill Nolan would never see a big man bump a little man without himself giving one back. But he was a pre-eminently fair player. As fair a footballer as ever went on the field. He was so fair that it affected his game, and often the voice of the crowd has called, Too fair, Bill Nolan. That was his characteristic. Those brave boys under him in the training camp on the burning desert in Egypt found out the same qualities in him  and they loved him for them. The boys here would do anything for Nolan. Those words tell the worth of the man. Physically, Nolan was a grand specimen of the Australian. Well over six feet [sic] in his socks, built in proportion, with blue eyes laughing out from his fresh-complexioned face, he looked every inch a leader, and men turned intuitively for him to command. He has played his part, and in the Heaven that is all our hopes it is such real men as he will find their best reward. On the 26th July, killed in action in France, our dear comrade, Sergeant W. Nolan. Dearly loved by all.  Inserted by his mates at South Melbourne Tramway Depot. William Nolan was buried at the Boulogne Eastern Cemetery, Pas de Calais, France. He is also remembered on the war memorial erected at Yarck in 1920. Many thanks to Warren Doubleday, Mike Ryan, Russell Jones and Brian Weedon, who provided valuable advice and assistance. Main, J. and Allen, D. (2002), Fallen  the ultimate heroes: footballers who never returned from war, Crown Content, Melbourne. In Australian rules football, the followers do not play in a set position  rather they follow the ball around the ground. The Metropolitan Junior Football Association (1892-1912) was renamed the Metropolitan Amateur Football Association in 1912 and then in 1933 it became the Victorian Amateur Football Association  the name by which it is known today. In a joint project by the Australian Army and the UK Department of Defence, a mass grave was discovered in 2008, containing the remains of 250 Australian and British troops buried by the Germans after the Battle of Fromelles. As at May 2016, 130 of the 211 Australians had been identified. Copyright © Noelle Jones 2017. Reproduced with permission.